Certain level of stress actually keeps you going. In fact this certain level is actually a driving force behind most of our daily activity. This is good stress and not the kind you should get worried about. 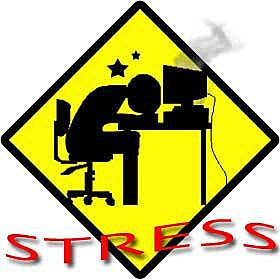 However when stress goes above the threshold that is when you should be alarmed and start doing something about it. EXERCISE: exercise is one of the most effective ways of beating stress and should never be neglected. Get out of your sedentary living; join a gym, or do kickboxing, pilates or aerobic yoga. Think of exercise as something to unwind rather than as a chore. It is your first step against your battle with stress. RELAXATION: simple solution- take 2 minutes mini breaks twice or thrice, everyday. Eliminate distraction and enjoy peace. Stretch your hands and legs. Rotate your neck clockwise and then anti clockwise. Breathe deeply. Ø Eat foods high in fiber e.g. fruits, vegetables, whole grain cereals. Ø Cut down on salt, sugar, nicotine and caffeine, red meat, alcohol and saturated fats. No one is saying to give them up completely just limit. Ø Increase your antioxidant intake. Include fresh fruits and vegetables, which are loaded with these. SLEEP: try going to bed 30-45 minutes earlier than usual. It makes a difference. HUMOR: it is a wonderful stress reliever. Laughter releases tension. A simple smile relieves your stress as well as that of others! Just like brushing your teeth, healthy habits should be cultivated in a daily basis. Following is a guide to daily tasks. Activity should be a daily occurrence. Walk, run, jump or skip for a minimum total of 20 minutes every day. Eat fruits, vegetable, grains, low fat dairy products and protein. Avoid sweets and processed foods. Meditate or spend a minimum of 5 minutes daily in a quiet place. Find your spiritual self. Discover what inspires you, raises your level of consciousness, motivates you and satisfies your soul. Exercise your brain. Read, study, solve problems and learn new skills. Just like your body the brain also degenerates with lack of use.